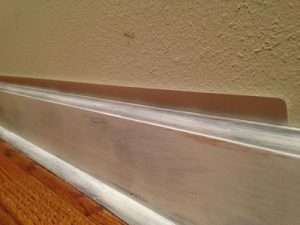 On the eve of New Year’s Eve, I was painting some corner molding and found it really difficult to cut in because where it met the wall, it had a rounded profile. I needed a guard, but didn’t have a commercial one. 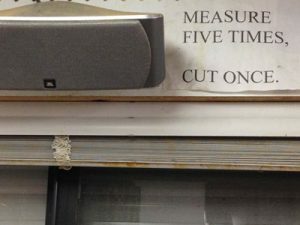 I could have used a putty knife, but the widest knife I had was only 5″, which would have been tedious. I remembered having one years ago that looked for all the world like a 12″ Venetian blind, but, if I still own that, I couldn’t find it. What I could find, though, was… a Venetian blind. When we were building our house, 22 years ago, we splurged a little on blinds for the garage windows so they would present a uniform appearance from the outside. Of course, I’m much too cheap to start cutting up blinds, but I remembered that they have two little valance slats at the top. No one would care if I borrowed one slat for a few days, would they? See the two little slats at the top that make a valance? I borrowed one, temporarily. Surprise! It worked so well that I forgot all about going to the store to buy a guide. The bonus is that the slat is almost 4 feet long, so it can be put in place and left there until a long piece of molding is painted. Now I just have to make sure nothing happens to it before I get it back on the window! This little Venetian blind slat saved the day on this painting job. Tuning and Using the Adjustable Spokeshave POLL: What Is Your Occupation?